The programme for the 2010 Anglesey Show has not yet been finalised and released, so I’ll bring it to you as soon as I get hold of it. 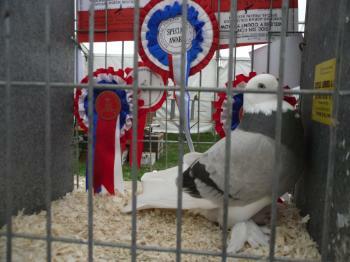 In the meantime, allow me to share with you images and tales from the 2009 Agricultural Show, which I enjoyed immensely. Having company with whom to share brilliant, exhausting days fun made the Show even more enjoyable. 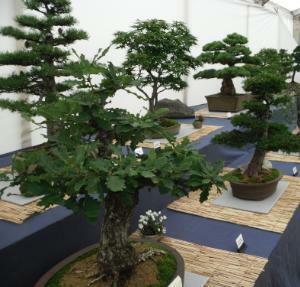 In the 2010 Show I intend to engage in a bit of forward planning to ensure that I get to the show tents I want to - while the judges are going around. 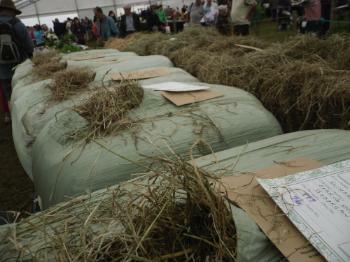 This time I intend to pit my wits against them in the giant vegetables competition and the fermenting silage bags. Much of the detailed information about Getting Here, Parking and what to bring along with you, I have taken directly from my 2009 page. 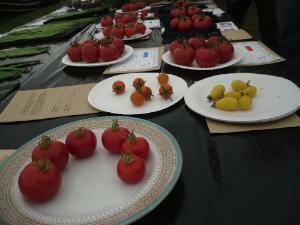 You can click that link at the bottom of this page to access even more information and images of the Anglesey Agricultural Show. TIP: Why not become a Vice-President? 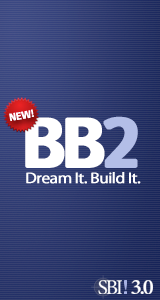 The benefits are excellent and the cost very affordable and a brilliant bargain. You can become a privileged parker and people will doff their caps and tug their forelocks as you pass. If you're interested then I've placed a link at the bottom. 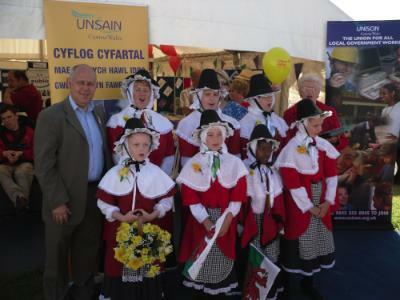 Albert Owen, MP for Ynys Mon, Parti Glan y Mor and Mrs Mary Parry MBE. Think of the Anglesey Showground Site as a large rectangle. The main gate entrance is at the bottom left. The Main Show Rings are one above the other on the left hand side. The Main Food, Vegetable, Poultry and Fluffy Bunnies and Craft tents are up from the bottom right corner. The Cattle Breeds are in the large main hall which is top centre. Clay Target Shooting is just off the top left corner. The Fair is off the top right corner - The screaming should draw you in the right direction. First of all, I have placed the image above in case you think I've got this thing about goats on this page. Acually I do. You will too when you visit the small competition tent behind the large cattle breed show halls. 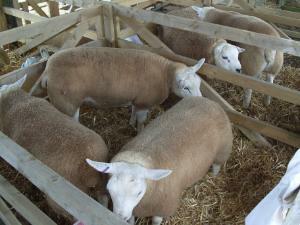 A permanent show site at the Anglesey Showground is all rather recent. Across my own lifetime I have visited the Anglesey Show further up the road toward Gwalchmai where the old wartime RAF baracks used to be located. I have also visited the show at the other side of the Mona Airfield near Bodffordd at Heneglwys. Reaching across my parents' lifetime one of their first memories is of visiting the annual Show in the fields of Lledwigan. This is the first large field on your right as you enter Llangefni directly off the A55 Expressway. 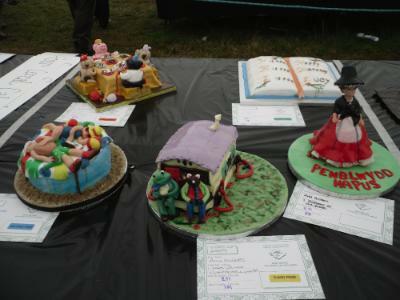 Indeed, it could have been regarded as an uniquely Llangefni Show once upon a time. It was regularly held in the town's football field. It siting in a football field indicates that it was once purely an agricultural show, without the sideshows and the hundreds of vendors and stall of today. You'll learn that Anglesey People call the Show the Primin. There's no such Welsh word as 'Primin'; however it is proposed that it is derived from the word 'Premium'. As in 'Of the Best' and 'First Prize'. We also call it 'Sioe Môn. It all comes down to genes in the end. No matter how much you've struggled with Jane Fonda's 'Burn', you'll never end up with her waist and hips. Shame that. The animals on show just ARE. They are born beautiful, strong and fertile. Okay, Man has a hand in it, which hopefully was warm. The Sheep and Goat Competion Areas are located just right of top centre of your imaginary rectangle. Bring your wellies if it's been raining - only a gentle semi-tropical warm sprinkling, quite naturally. 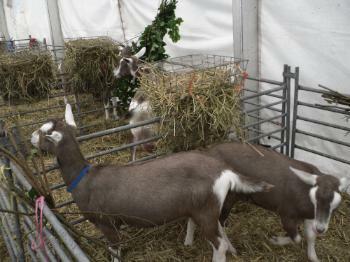 The Goat Tent is really worth a visit if you have children, because they will fall in love with the billys and nannies on display in their little pens. A Note of Caution: I enjoy petting the animals but always take care to wash my hands afterwards. This is especially important for your children. It is almost de rigeur these days to carry a tube of Hand Sanitiser and I would advise you to bring some along. That way children can touch these timid and trusting little creatures and you can have peace of mind over their hygiene. Did you know? Feed a female goat cabbage and her milk will taste of cabbage. Feed her with pithy observations and it might taste of irony. Questions to Ask: What are those leaved branches they feed the goats? Why do the goats need them? There was no-one about to ask when I visited so please let me know, in case my timing's off again this year. There's a large tent right at the bottom right of the Showground Site where you'll find Elvis. You'll also find chickens with 70s flared trousers and the mildly disturbing looking pigeons who'd look comfortable on Doctor Who. Quite clearly the speciment below is a multiple winner and 'Special'. Its bearing seems to indicate a certain pride. Poor dab's been trained that way because when you stop to gaze on the beautiful bird it will automatically preen itself. Please take the time to find the tall collared pigeons because they'll remind you of the great Elvis Comeback Concert in Las Vagas. I get this desperate urge to open all the cage doors for the fluffy bunnies. However, it would be a pointless act because they wouldn't move far from their cages. Their world can only be a few feet at a time wherever they are. Now, what's Prince Charles having a good look at right here. I believe His Highness was there incognito. Seeing that tail going up it could be non fragrante derelicto. Isn't she pretty? The rider! Can you blame Royal eyes wandering hither and thither to rest here. The main National Championship horse competitions are held in the Main Ring, while the aspiring Pony Club debutantes make their mark on equine history. You'll find this spot behind the large Show Halls. Whether Prince Charles is there depends on whether the Duchess is off somewhere, I suppose. Don't Worry! It's just a bit of smug-smart photography. The Anglesey Show Fair is a colourful and noisy affair with plenty of rides to scare you and it's a place to test your nerve. As well as your tummy if you've had a few too many burgers and candy floss. Two friends, Denis and Mr X (who shall remain nameless) were just staggering away from the top instrument of torture when I happened across them. Den bore a broad grin while Mr X (who shall remain nameless) remained a disturbed silent soul beside him. As Den gets older he's getting wider and Mr X (who shall remain nameless) is a large rotund expression of Anglesey manliness. Den was laughing as he described that they had both held up the ride while two assistants struggled to buckle them both in. If you know a bit of physics then you'll have guessed that the centrifugal force of the device would have been accelerated further sideways by the additional masses of Den and Mr X (who shall remain nameless). 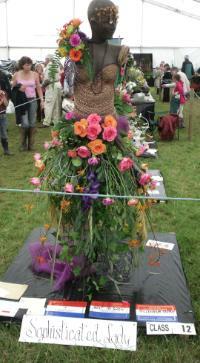 If you've already had a look at my 2009 Anglesey Show page then you'll already read about Sniffing Hey! 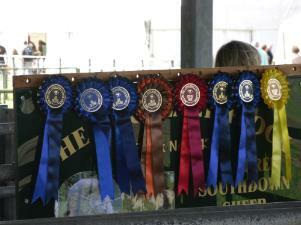 It's lovely wandering around the Showground with company because there's always something you'll miss on your own. So there we were, watching farmers pull out a handful of the silage and sniff it. Others were nose deep in little bags like glue-sniffers. There was quite a bit of debate going on, so we decided to carry out our own bit of comparative olfactory analysis. It's fascinating. It really is. Did you know that the scent can be as refined as a Bordeaux that has blossomed? Aniseed, cinammon, deepest greens and strong reflections of a Spring or Summer harvest. Silage ferments and the characteristics of the scent are transient. These were silage bags that were developing nicely and becoming richer in available nutrient for the beast who would tuck in. Please take some time for a bit of your own olfactory analysis. 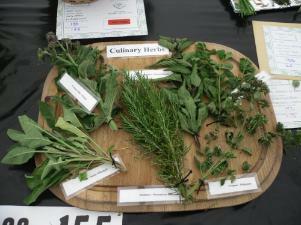 You won't have a clue about the agricultural significance of what you're sniffing. However, it really is fascinating to compare one with the other. 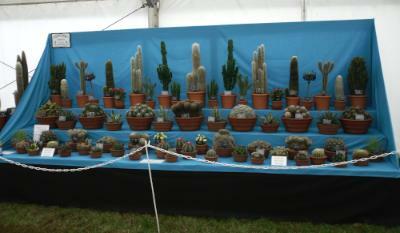 How's this for symmetric cactii presentation. Makes you wonder how many were discarded as being inferior. I bet I'd be a resentful cactus fomentimg dissent from a black bin bag. One Day. One Day. You can only push a cactus so far. Actually, you can't push a cactus at all. Because IT HURTS! "If they haven't done something entertaining in the next thirty seconds I'm going for Welsh Black Beef Sandwich." "Mmmm ... Welsh Black Beef Sandwich ... Mmmmmm"
Okay. So ... it's a tree. I wonder what a Sequoia Bonsai would look like? Herbs, lettuce ... There's a theme developing here. "You say tomato and I say..."
Salata Domates as a side-dish with chips sprinkled with salt and oregano. I'd begin with Soupa Fassolia and a bottle of Fix beer. 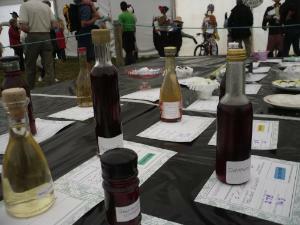 Mr Trefor (Solomon) Jones didn't compete in this year's Anglesey Show with his Organic Onion Dry White Wine. Bad news for Uncle Arnold who was Head Taster. 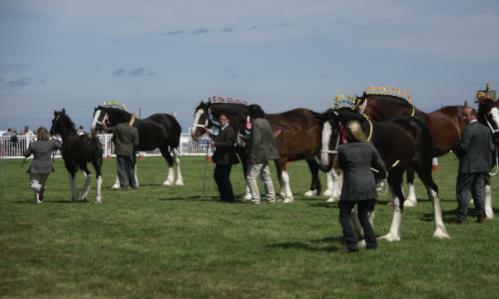 Take a few minutes out of your day to reflect on your last visit to the Anglesey Show. I sincerely hope that you a fabulous time. There again you may have experienced some problems that you'd like to share. Sooo ... If you've stories,thoughts or information you'd care to share with other visitors then Please CLICK HERE. 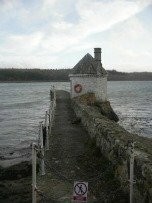 August brings with it wonderfully warm, sunny weather, though occasionally the odd semi-tropical rain shower has been observed and experienced here on Anglesey. Good sensible shoes. You're going to enjoy a full day. Water-Proofs - Just in case. Hats for the children and yourself. Water to drink - Or make sure you have plenty of drinking pitstops. Excellent loos on the showground. On hand are St John's, the Ambulance Service, the Fire Brigade and the excellent Anglesey First Response Team with Duncan, Al Prince and the team. First of all you should be aware that this can be a pretty tiring day for any animal or human. Like little children, dogs can become tired and very tempramental. Any dogs that visit should be kept on a leash at all times. All show animals are stressed by the attention and the crowds and you can help by keeping this to a minimum by either keeping your pet at home or keeping it on leash and under control. Room for more than 3,000 vehicles. Your entrance fee covers this. 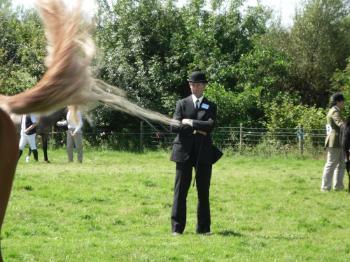 I must tell you that the stewards employed by the Anglesey Agricultural Society are excellent at their jobs every year. WORTH KNOWING: If you don't want to bring your car with you, then don't worry. MAKE SURE YOU TAKE THE BUS THAT GOES THROUGH GWALCHMAI, OTHERWISE YOU'LL MISS THE ANGLESEY SHOW. I refer you here to my page on getting to Anglesey in the first place. I also list trains, planes and buses. Click here for transport options. It's very difficult to get lost and confused trying to find the Anglesey Show Ground in Mona on the day because the AA has usually singposted the area on the weekend before. However, if you wish to carry out a reconaissance visit before hand then the instructions below should guide you safely to the Mona Showground. N.B. You may be tempted to try and be clever on the days of the show and approach from the side-road from Llynfaes that comes out by the old Toll House. Forget it. Many other drivers will have thought of exactly the same thing. You won't be given priority over the A5 traffic. Travelling from the Britannia Bridge take junction 6 for Llangefni. Do not head into Llangefni but take take the first uphill left turning on the second roundabout. Follow this road for two miles. The Anglesey Show marquees and tents will be plain to see in the distance. If you are arriving later in the day, then you will probably end up in traffic. Either plan to arrive very early (8:00a.m.) or leave it until after 11:00a.m. when the traffic is lighter and moves quicker. Traffic management is quite slick despite the thousands of vehicles that fall on the area for those two days of the Show. If you are arriving for the Anglesey Show from Ireland via the Holyhead Ferries (Stena or Irish Ferries) then you need to take the A55 Express Carriageway out of Holyhead. After about 10 minutes take Junction 5 indicating Rhosneigr. Come up the ramp and take the first left turning. Follow this down to the A5 and turn right. A couple of miles later you'll travel through the village of Gwalchmai. 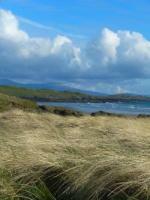 The Anglesey Show is about a mile from here and pretty obvious on your right. 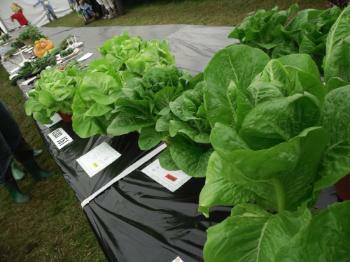 Visit ANGLESEY SHOW 2009 Page. 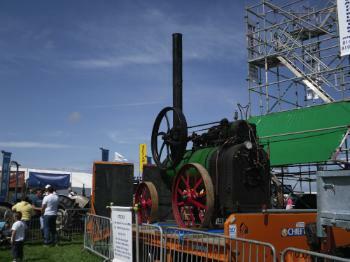 Return from Anglesey Show 2010 to HOME PAGE.